Michael Spoerhase is the General Manager at SERVPRO of Lincoln & Polk Counties. Michael’s exceptional work ethic and ability to create new opportunities within the franchise makes him a vital asset to our franchise. He is IICRC certified and trained in WRT, FSRT, OCT, AMRT and HST. Leah Ross is the Office Manager for SERVPRO of Lincoln & Polk Counties. Leah holds a key role in our franchise by maintaining operations and organization of the entire franchise. Her ability to maintain the “go get ‘em” attitude and positive outlook make her irreplaceable. She is IICRC certified and trained in WTR. Stephanie Marshall is part of our Office Team at SERVPRO of Lincoln & Polk Counties. Stephanie has that “glowing” personality and her exceptional work ethic has made her a long time vital asset to our franchise. She is IICRC certified and trained in WRT. She is also SERVPRO ECTP trained in Water and Fire. Stephanie is a fan of Harley Quinn and retro anchors. She also graduated from Oregon State University where she majored in photography and fine arts. 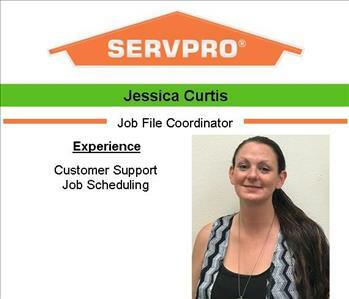 Jessica Curtis is part of our Office Team at SERVPRO of Lincoln & Polk Counties. Jessica’s attention to detail and ability to organize the crew’s daily job schedule has made her a great asset to our franchise. She is ECTP trained in Water and Fire. Melinda Marinko is part of our Office Team at SERVPRO of Lincoln & Polk Counties. Melinda’s ability to multi-task under pressure while keeping a smile and cheery demeanor makes her a highly valued asset to our franchise. 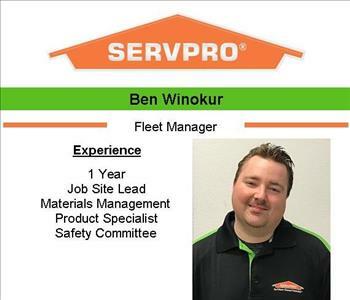 Ben Winokur is our Fleet Manager at SERVPRO of Lincoln & Polk Counties. Ben’s strong work ethic and ability to manage our company fleet and facility allows the rest of the crew to focus on their perspective jobs. He is a great asset to our franchise. 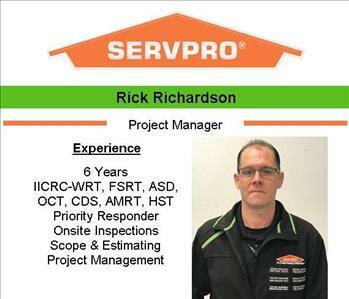 Rick Richardson is the Project Manager at SERVPRO of Lincoln & Polk Counties. Rick’s ability to facilitate his crews in an organized manner and establishing new customer contacts has made him an irreplaceable asset to our franchise. He is IICRC certified and trained in WRT, FSRT, ASD, OCT, CDS, AMART, and HST. 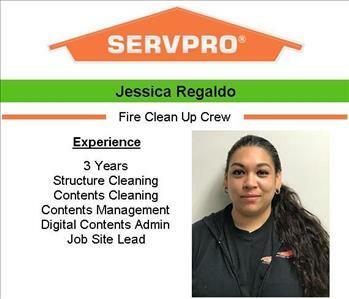 Jessica Regaldo is part of our Fire Clean Up Crew at SERVPRO of Lincoln & Polk Counties. Jessica holds multiple hats in her position now that she is a job site lead and digital contents admin. Her skills continue to grow and that makes her a vital asset to our franchise. Maria Alvarez is part of our Fire Clean Up Crew at SERVPRO of Lincoln & Polk Counties. Maria’s attention to detail and strong work ethic make her a role model and a great asset to our franchise. 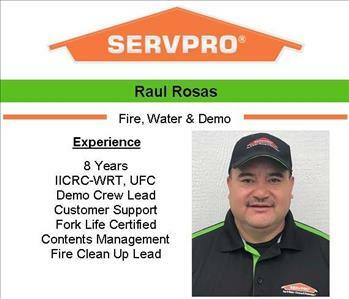 Raul Rosas is part of our Fire, Water and Demo Team at SERVPRO of Lincoln & Polk Counties. Raul’s compassionate nature with our customers and his exceptional work ethic and quality has made him a vital and trusted asset to our franchise. He is IICRC certified and trained in WRT and UFC. Amanda McGhee is part of our Fire Clean Up Crew at SERVPRO of Lincoln & Polk Counties. Amanda’s ability to multi-task and integrate herself into any situation makes her a valued team member. 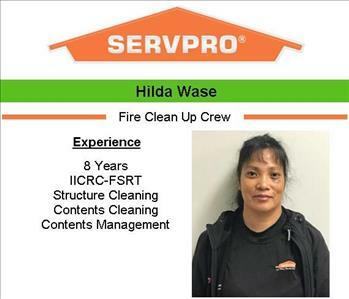 Hilda Wase is part of our Fire Clean Up Crew at SERVPRO of Lincoln & Polk Counties. Hilda’s ability to organize and manage customer contents and proper cleaning makes her a valued team member. She is IICRC certified and trained in FSRT. 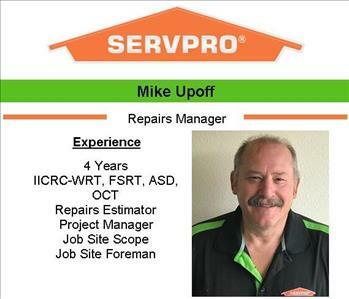 Mike Upoff is the Repairs Manager at SERVPRO of Lincoln & Polk Counties exceptional work ethic makes him a strong asset to our franchise. He is IICRC certified and trained in WRT, FSRT, ASD and OCT.
Miguel Delgadillo is part of our Carpentry Team at SERVPRO of Lincoln & Polk Counties. Miguel has a strong worth ethic and gets the job done and that is what makes him a great asset to our franchise. Volney Lollar is part of our Carpentry Team at SERVPRO of Lincoln & Polk Counties. Volney has a strong worth ethic and gets the job done and that is what makes him a great asset to our franchise. 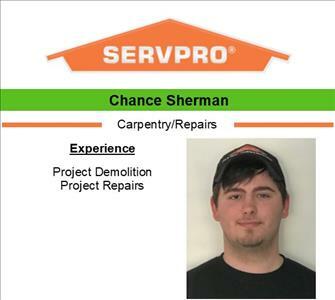 Chance Sherman is part of our Carpentry Team at SERVPRO of Lincoln & Polk Counties. Chance has a strong worth ethic and gets the job done and that is what makes him a great asset to our franchise. Favorite hobbies: Hiking, hunting and going to parks with his two sons. Chad Kerlegan is the Sales & Marketing Manager for SERVPRO of Lincoln & Polk Counties. He started with the company in October 2014. 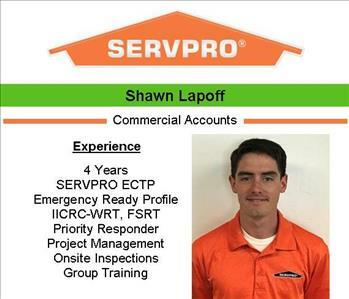 Prior to SERVPRO he worked as a general contractor performing residential property preservation and maintenance for national mortgage servicing companies. 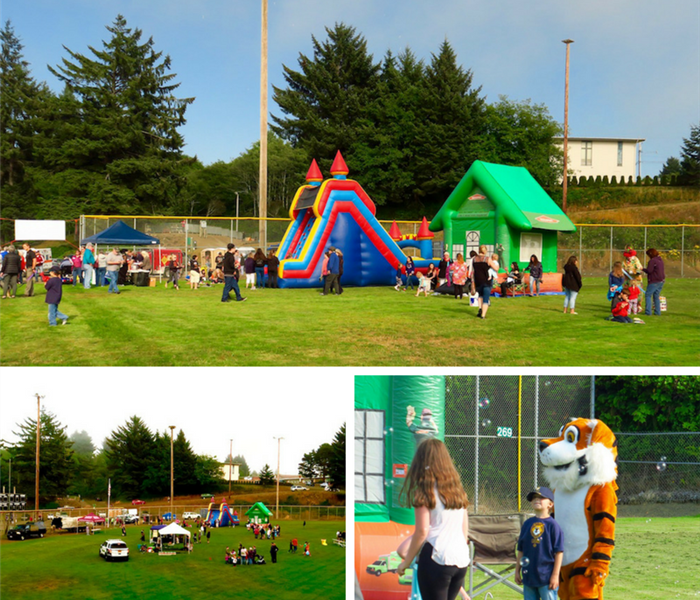 In this role he learned the impact and importance of property upkeep, security and repairs. 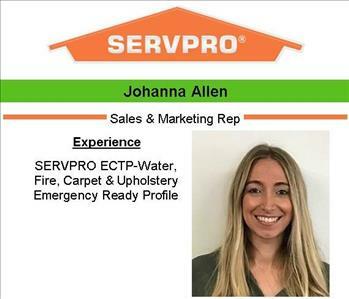 Johanna Allen is one of our Sales & Marketing Representatives at SERVPRO of Lincoln & Polk Counties. Johanna’s bubbly personality and positive outlook has made her a fantastic part of our Marketing Team. She is SERVPRO ECTP trained in Water, Fire and Carpet & Upholstery. 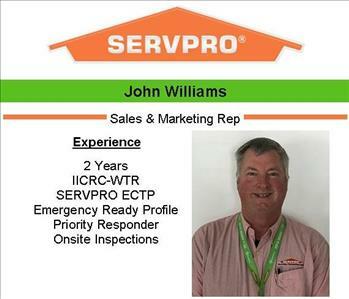 John Williams is our Sales & Marketing Representative for SERVPRO of Lincoln & Polk Counties. John’s commitment to the Lincoln & Polk Counties branch makes him a valued asset to our franchise. 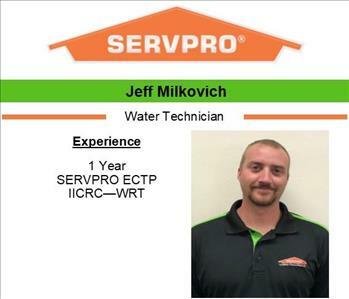 He is IICRC certified in WTR and SERVPRO ECTP trained in Water and Fire. 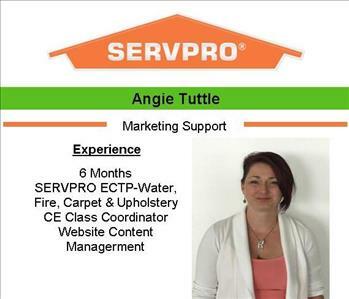 Angie Tuttle is part of our Marketing Team at SERVPRO of Lincoln & Polk Counties. Angie’s ability to think creatively and multi-task has made her a great addition to our Marketing Team. She is SERVPRO ECTP trained in Water, Fire and Carpet & Upholstery. Angie has a daughter who is in taekwondo and always full of energy. She is said to be very exhausting. She graduated from Portland State University with a B.S. in Psychology. Favorite Quote: “Absence from those we love is self from self – a deadly banishment.” – William Shakespeare. Hobbies: Baking, Xbox One, writing and hiking with her daughter.